From the Anvil grills, nails and door studs are hand forged by British artisans. 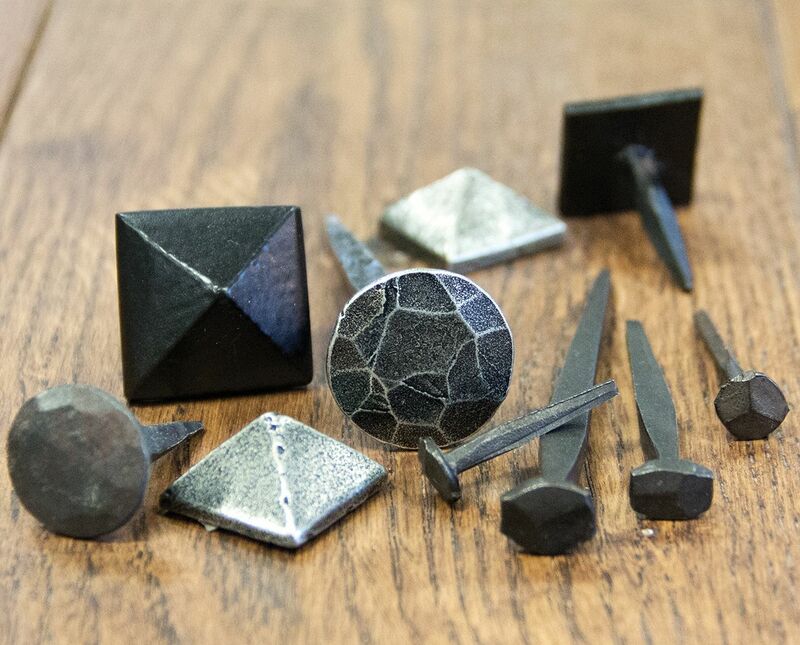 Among this range, we supply rosehead nails, round head nails, pyramid door studs and raised door grills. Round head nails are hand crafted from a single piece of steel to provide strength and high-quality and can be used in a variety of settings. Rosehead nails are ideal to be used on braced and ledged panel doors, whilst pyramid door studs are used as decorative detail to finish off a piece of furniture or door. Front doors can be decorated further with a variety of other ironmongery products. For instance, door numerals or letters can give a stylish look to any door. Door knockers can also be a statement piece on an entrance door. We stock traditional door knockers, such as the pewter Shropshire ring door knocker and more modern knockers, such as the chrome ring door knocker. We also supply a variety of letter plates with door knockers incorporated, including the brass postal letter plate, but also without door knockers, such as the black blacksmith traditional letterbox. To cover our letter plates, we have available a selection of letter tidies. Letter tidies are not only used to give an overall neater appearance to a door but also to work as a draught excluder. Escutcheons are also used for the same reason, but to cover the door keyhole. Centre door knobs are also an elegant and functional piece for entrance doors. We supply a variety of centre door knobs to help pull a front door closed. Our centre door knobs are ideal for traditional and modern properties. In case you don’t want a centre door knob, we have available a range of door cylinder pulls.